The Caribbean is one of the most laid back places on the planet for a kiteboarding trip. Friendly, generous and relaxed locals, warm water and tropical trades all make the Caribbean Islands a great place to travel to. The best kitesurfing season on most of the islands is from December to June but you can kite all year round (with the exception of September/October which is hurricane season). The Trade Winds, blow nearly the whole year but are more intense in spring/summer. The wind tends to vary from 10 to 30 knots but is about 12 knots on average. SWEET, SO WHERE CAN I KITE IN THE CARIBBEAN? The Guadeloupe archipelago consists of 5 small islands the 2 main islands (Basse-Terre & Grand-Terre) are joined by a bridge over ‘la Riviere Salee’. Tropical climate & loads of good kitesurfing spots for kitesurfers of all abilities. Small but diverse, the islands of the Caribbean Sea are home to a mixture of native, European, African, and Asian cultures. Sugar plantations, brought to the region by the Portuguese in the 17th century, led to the rise of slavery. Even after slavery was abolished two centuries later, the structure of agriculture, which benefited a few at the expense of many, remained. Today most nations are independent, and while agriculture still endures, tourism is the backbone of the economy. The Caribbean is a region of the Americas consisting of the Caribbean Sea, its islands (most of which enclose the sea), and the surrounding coasts. Located southeast of Northern America, east of Central America, and to the north and west of South America, the Caribbean is usually considered a subregion of North America. Situated largely on the Caribbean Plate, the area comprises more than 7,000 islands, islets, reefs, and cayes. The West Indies consist of the Antilles, divided into the larger Greater Antilles which bound the sea on the north and the Lesser Antilles on the east, and the Bahamas which are northeast of the sea. Bermuda lies much further to the north in the Atlantic Ocean and is sometimes included in the West Indies. Geopolitically, the West Indies are organized into 28 territories including sovereign states, overseas departments, and dependencies. The name ‘Caribbean‘ is named after the Caribs, one of the dominant Amerindian groups in the region at the time of European contact during the late 15th century. The analogous ‘West Indies‘ originates from Christopher Columbus’ idea that he had landed in the Indies (then meaning all of south and east Asia) when he had actually reached the Americas. The Spanish term ‘Antillas‘ was commonly assigned to the newly discovered lands; stemming from this, ‘Sea of the Antilles‘ is a common alternate name for the Caribbean Sea in various European languages. 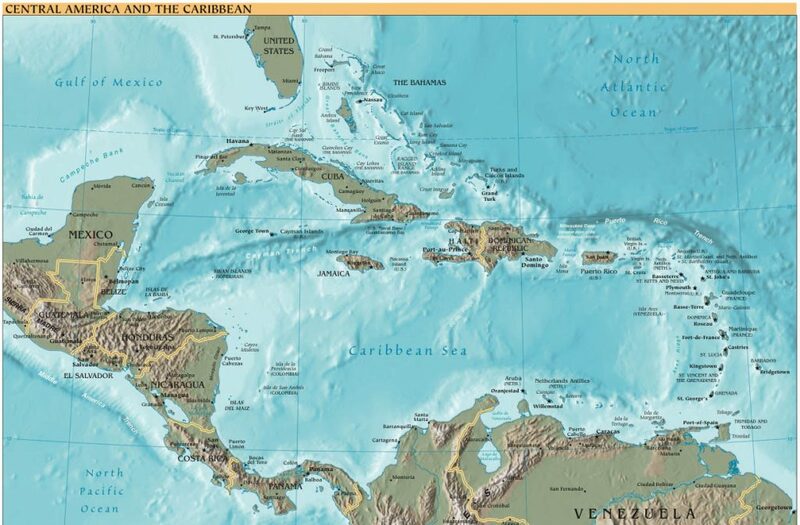 The Carribbean Sea, tropical sea, c.970,000 sq mi (2,512,950 sq km), arm of the Atlantic Ocean, Central America. It is bordered on the N and E by the West Indies archipelago, on the S by South America, and on the W by the Central American isthmus. 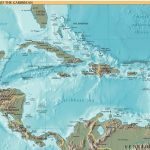 The Caribbean is linked to the Gulf of Mexico by the Yucatán Channel; to the Atlantic by many straits, of which the Windward Channel and Mona Passage are the most important; and to the Pacific Ocean by the Panama Canal. The Magdalena is the largest river entering the sea; Lake Maracaibo is its largest embayment. MAP SEARCH – WHERE ON EARTH AM I HEADED? Click on the map below for a closer view simply click anywhere on the map.